Today's computers provide storage of tremendous quantities of information with extremely large data densities, but writing and retrieving this information expends a lot of energy. More than 99 percent of the consumed power of information storage and processing is wasted in the form of heat, a big headache that still has not abated. 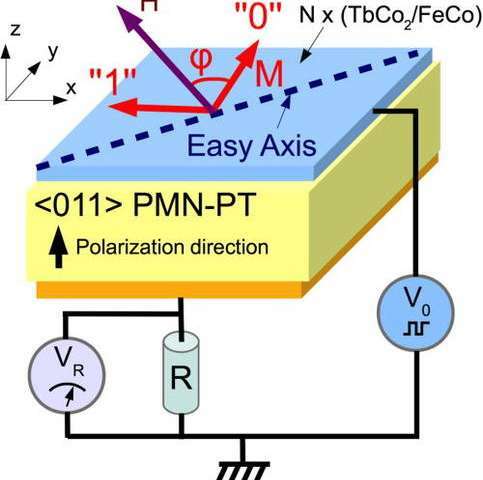 A team of researchers from France and Russia has now developed a magnetoelectric random access memory (MELRAM) cell that has the potential to increase power efficiency, and thereby decrease heat waste, by orders of magnitude for read operations at room temperature. The research could aid production of devices such as instant-on laptops, close-to-zero-consumption flash drives, and data storage centers that require much less air conditioning. The research team reported their findings this week in Applied Physics Letters. The core of the researchers' MELRAM memory cell is based on combining the properties of two types of materials by coupling them mechanically. Magnetic alloys—one based on a combination of terbium-cobalt and the other based on iron and cobalt—with thicknesses of a few nanometers are stacked on top of one another. The alloys form a magnetoelastic nanocomposite material whose magnetic spins react to mechanical stress.